In the world I grew up in, there were certain unmistakable truths. For instance, we were a Catholic family. We believed in God, were not allowed to get close to blasphemy, and were never allowed to skip church, unless we had a fever or were throwing up. Another unmistakable truth was that I was part of a family: the Ryans. I grew up in a family where my dad and mom were home most nights I can remember and we ate dinner at the table, with my four siblings unless one of us had a fever or were throwing up. It makes me smile, at times, remembering my childhood, where the unmistakable truths became my strength; my touchstones. Even during my periods of rebellion, I relied on them. When I met Mario he blended into my family and became close with all of us. Kids produced grandchildren for my parents, we spent most holidays together, and we never lived further than two hours from anyone by car. Now oceans and plane changes and time zones cause a physical separation. When you grow up with the family values I did, understanding a "missionary calling" isn't necessarily contagious. Even though my parents are in full-time ministry, sacrificing their daughter to the Work of God in Africa is a great act of faith. Nevertheless, there are days when I miss my family desperately. To be honest, there are days where "I want my mom". I'm 48 and that feeling of attachment is still so real. The day of the 94.7 Cycle challenge (three days ago) was one of those days. 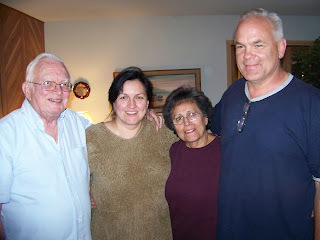 By the time I got home I had nothing left, and would have given anything to have Vince and Alicia and my parents here. I especially was dying to talk to my mom. The morning after my race post, my mom sent me an email, which I want to share part of. It's the kind of letter you dream of getting from your mom, full of understanding and encouragement. In it, is inspiration for all mothers who encourage their children the best way we know how. It is a gentle peek into my life... and I hope you enjoy the wisdom and love half as much as I did. It was so nice having such a nice long visit on the phone last night (morning to you). I was touched by your saying that you needed your Mamma, so I was glad we had that time together. I spent about 3 hours at Tracy Interfaith Ministries helping people coming in for Thanksgiving baskets in addition to regular food. On a very busy day we do about 100 interviews. Today we did 246 total! We had 5 people conducting interviews instead of the regular 3, so that helped. Just goes to show you the signs of the times. I just finished reading your blog. It was very much like doing a marathon myself! Lots of painful details that I really do wonder about your taking something like this on. There's so much I could say, but won't--not now anyway. You know, after I raised our kids I learned something I found to be very important--that when your child gets hurt doing something they shouldn't have been doing in the first place, or if they're in tears over a disappointing outcome of play, or work, friends, etc., etc., you should first "validate" them by hugging them, comforting them, showing them sympathy, asking them just how that feels, so that they receive the sympathy and comfort they're looking for FIRST. THEN you can lecture them afterwards. Not many parents know about this technique, because as parents we're always trying to correct our children while it's fresh in our minds to do so. Too bad and sad. Anyway, reading your blog brought this to my mind. So suffice it to say that I will at this time just tell you that I love you very much, I admire you, and am so very proud of you. Because I really am. I can't help but be reminded of that little girl of 4 or 5 who would somehow think of different ways to to do ordinary things and get excited about doing it in the process! Having to have things done today, not tomorrow, not even later, but NOW--very impatient. And being so passionate about it that if it didn't come out as you planned, you would become emotional over it. Does any of this sound familiar even today? Don't become too discouraged about not finishing what you set out to accomplish. Disappointed yes, discouraged, no. I know you must be so grateful to God for your partner in life--Mario. Have you remembered to give thanks to God for life today? We as old people give thanks for that every day when we wake up because WOW--We've been granted another day of life!! Very exciting for us as oldsters. But I wonder how many young people do this? Thanks, Lord, for today, thank you for all my blessings, thank you for all the children you blessed us with, and may you keep them strong and eager to face the challenges that lie ahead--always trusting in your love and care.